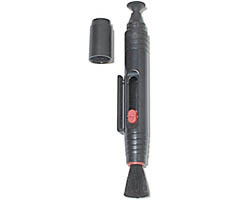 This is a pen-shaped lens cleaning kit by Sima, there are similar products by other manufacturers as for example Nikon. One of the tips of the pen features a cleaning compound that will not spill or dry out, it can be used to remove minor scratches, grease and dirt from lenses without damaging them. The product is applied making circular movements over the lens with the soft tip. It removes fingerprings, smudges and other marks. This end of the pen has a cap. The other end features a retractable soft brush that can be used to remove dust and small particles from the lens before cleaning, dust can scratch the lens when cleaning if you don't remove it first. For clean lenses the brush is good enough, when the lens is not clean you have to use the brush then apply the cleaning tip and then brush again. This kit can be used with camera lenses, sunglasses, reading glasses, camcorders, telescopes, binoculars, flashlights and anything that has a lens and needs some careful cleaning. It has been particularly useful to remove grease and fingerprints from sunglasses and flashlights to me and can also be used to clean your wristwatch. It can be obtained in most optics or you can order for $8.50 from this site. This is a pen-sized multi-tool, it's basically a pen that carries inside several accesories. It includes a short blade and a long blade x-acto style. A hole punch, phillips screwdriver, a file, a flat screwdriver, scraper, tweezers, a small fork,a pen,a saw and a wire-stripper / staple-remover. The tools are as expected not the best in each category but they can be used to do the job, the blades are very useful for precision cutting and small cutting jobs. The process to switch from one tool to another takes about 20 to 40 seconds, the biggest problem being the storage of all the small accessories that can get lost in the process. It is a nice gift and as the size this tool is it will probably be an excellent addition to many EDC kits, think about all the pen holders in clothing or bags that you are not using. The tools work great for hobbyists, specially when you frequently deal with micro repair jobs and small things. The buck x-tract is a multi tool featuring a knife as the main tool, it comes with pliers, two screwdrivers, can opener, bottle opener and a lanyard attachment. The knife is a 3'' 420HC steel knife with a semi-serrated blade, very sharp from the box and useful for all the normal cutting jobs you can think for a knife. 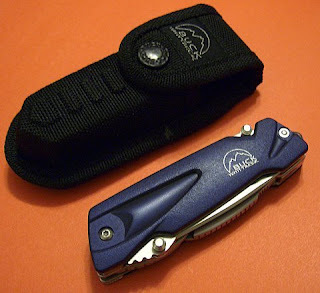 It can be opened and closed with one hand using thumbstuds and features a liner locking mechanism. The pliers are small and have wire/cable cutters, they can also be opened with just one handed operation. The can/bottle opener is smaller than many others but certainly suitable for the job. The last two accesories are a slidling philips and flat screwdrivers. The handle is textured thermoplastic offering a good grip that may be slightly slippery if the tool is used with greasy hands. The X-tract offers a nice combination of accessory tools for the buck knife which is of very good quality, if you like buck knives you will love to have the X-tract. You can read more information at the product webpage or order for $33 from this site. 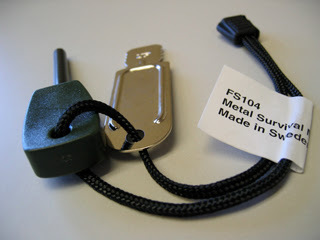 The Firesteel firestarter is a small kit for fire starting that can be easily carried in a keychain since it is shaped as a key. Essentially the firesteel is a high grade piece of flint that when scratched with metal will produce many sparks. The firesteel comes with a metal striking tool that you can use or not since any steel knife will work in the same way. In our tests small pocket saws worked great and you don't have to scratch your knife if you use one. To use it just strike the metal striker or a metal tool against the flint to produce sparks that you can use to light up tinder, such as tinder quick, magnesium scraps, wax covered cotton balls or others the amount of sparks it produces should be good enough to get the fire going. The tool will be good for thousands of uses and if it gets wet it can still be used without a problem. It may be a little too big for some keychains, in our opinion the plastic handle is too big without a good reason so sanding it with a dremel to a smaller size may be a practical option. The firestell can be ordered for about $9 from Countycomm. 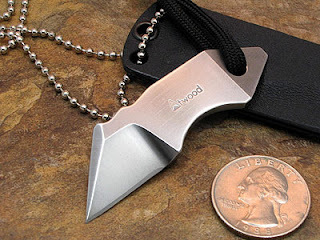 The Booger is a very small knife with a pointy tip from Peter Atwood, it can be used for cutting, chopping and for any task where a fine pointy tip can be useful, including scraping, cleaning and fine cutting jobs. Made of S30V steel the Booger is a very high quality knife that will resist normal use and not so normal abuse without breaking or scratching badly. They are 1/8'' thick and about 2.5'' long and come with a kydex sheath that can be used for keychain or neck carry bead chain included. This is no doubt a quality little knife that will be a handy companion to its user. We found it great for hobbies and other ocupations where you do some fine cutting, it is a very precise tool and it is a pleasure to carry it. You can get it for $65 from Peter Atwood's website. Due to limited stock you may want to check other members of the Booger family and ask Peter about stock. This is a digital compass with a thermometer and clock. by HighGear. The compass can display the bearing and can be adjusted for magnetic declination. It has a leveling bubble for increased accuracy, you can take either a single reading or use it in continuous mode. The digital thermometer has a 0.1 C or F resolution and works from -4F (-20C) to 131F (55C). The watch measures time, day, date and month in 12 or 24 hour format and supports dual time zones. It has a daily alarm and a chronometer. Clipped to your backpack or a keychain this device is very handy for outdoor activities where navigation is important, it is water resistant and has EL backlight for the night. 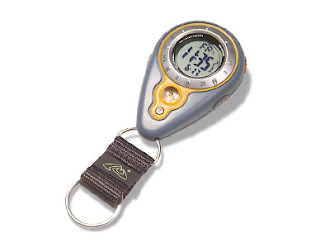 You can read more in the product page or order for $35 from Cabelas. 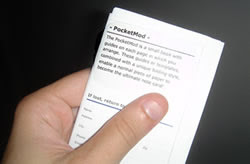 The Pocketmod is a 8.5 x 11´´ sheet of paper split into 8 sections that once folded makes a little paper book and allows you to select from different inserts. You can have a calendar, day planner, notes, tables, story board, lists, contacts, games and many other options. From the website you can design your own pocketmod selecting the 8 sections you will want to use, then print it, fold it following the instructions and you are ready to go. The final result is a 2x3 notepad with the 8 sections you selected. It is small and flat enough to go in a pocket, wallet or inside a book. For customization the website offers a tool to convert a PDF file to pocketmod format so you can add your own information, guides, and make topic specific pocket mods for you and your friends. Pocketmods are free and you can try them at pocketmod.com, enjoy. This is a titanium rescue ring from TAD Gear, it has a removable spike that can be used to break glass windows in case of emergencies. The spike comes with an attachment base that has a hole for a splitring so you can put it in your keychain and use it only when needed, in case of need just unscrew the spike and screw it to the ring. 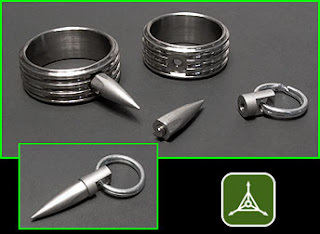 The Ring is made of titanium and the spike is stainless steel. Optionally you can screw an SS button compass instead of the spike and use the ring for navigation (compass not included). As a piece of titanium jewelry the ring is really nice and confortable to use and compared to other Ti rings it is very affordable, offering the option of the spike as an emergency device in case of need. The threads to attach the spike to your keyring are not very long so with some time it will eventually get loose and you are in a big risk of losing the spike. Besides this problem it is not very clear how quickly you can get the spike ready in case of need if you are rescuing somebody it may help, if you are the one in need of a quick exit it is probably too slow and too small to be correctly operated during an emergency. You can get it in sizes 5 to 13 from TAD Gear. The Proton is a multi-level white-red hybrid flashlight from LRI using a single AA battery. The flashlight has 6 5mm white leds surrounding a single 5mm red led. The leds are embedded in a GID epoxy so after being used for a while the bezel of the light will glow in the dark and that will make it easier to locate. The interfase uses a single button to operate the multiple modes, from off you can click to activate the white led (in maximum brightness) or click and hold to acivate the red led in minimum brightness. Once you have activated the light press and hold to change the brightness, the white led goes from max to min while the red one goes from min to max. After the min or max levels are reached the light will flash twice, keep holding the buttton to reach the low, medium and high strobes or the SOS mode. To access the secret "all white LEDs on including the red LED" mode: Press and hold till red turns on and keep holding. Release when the first blink mode is reached (this is the second quick flash you see when the red LED is brightest). Turn it off. Turn it on with a click and all LEDs will be on until you use the red mode again. If you press-hold to turn the light on in red-only mode, the "all LEDs mode" will be turned off again and only the white LEDs will turn on with a click of the switch. There is also a secret "50% Red" mode, available only in the red LED setting that will help conserve battery life. If you press-hold to turn on the red LED, and immediately release the button as soon as the red LED turns on, you can then press-hold the button to ramp up the LED in 50% mode. This appears almost as bright as the regular red LED only mode, but uses less power. The light comes with a claw clip for keychain carry and a pocket clip to carry the flashlight bezel down clipped to a pocket, the pocket clip can be removed replacing with a spacer. The light uses a single common AA battery and can use either alkaline, rechargeable Ni-Mh or Lithium batteries. The runtime goes from one hour in maximum brightness to several hours in the lowest settings. Even in the maximum settings this is not a bright flashlight the beam type and brightness make it good for doing close tasks using diffferent brightness levels rather than for outdoor usage. The multiple modes and the ability to have either red or white light makes it an interesting combo. You can read more and order for $70 from LRI's website. 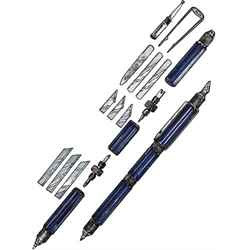 This is a telescoping model from Fisher Space Pen, it uses a Fisher universal pressurized refill so it can write under water, upside down, on greasy surfaces and in very cold climates without problems. This telescoping model goes from 3.90'' closed to 4.75'' when open to offer a longer surface for holding it when writing. To open and close it you just push and pull. When the pen is collapsed the writing tip will be hidden and appears when you extend it so you can only write in the extended configuration and there is no cap. The pen has a very nice looking and is confortable for writing but it doesn't have a pocket clip or a hole for a splitring so the carrying options are limited. You can order it for $27 from Penwa. 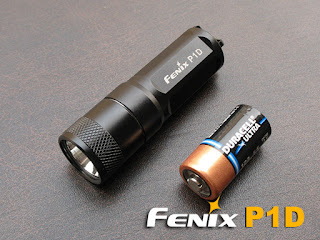 The P1DCE is a multi-level Cree LED flashlight from Fenix using a single C123 lithium battery. Using a Cree XR-E LED this little flashlight can produce a lot of light, it has 3 levels reaching up to 120 lumen in the brightest mode, comparable and usually brighter than many other bigger lights using 2 or 3 cells with luxeon leds. Since the switch is a simple twisty you need to twist and untwist the head to swith modes, by twisting and untwisting in less than 1.5 seconds you change modes, if the light stays on for more than 1.5 seconds the next twist-untwist will revert to primary mode. The modes are primary (medium brightness), then high (max brightness) then low mode, strobe, SOS. The sequence may or may not be right to your needs but can't be changed. Starting in primary mode is a good compromise between those that want the flashlight to start at maximum or minimum brightness. The body is constructed in HA-III anodized aluminium resistant to impacts and scratches, o-rings are used to make the light water-resistant and dunkable, the lens is coated with an anti-reflective material and it's made of glass. 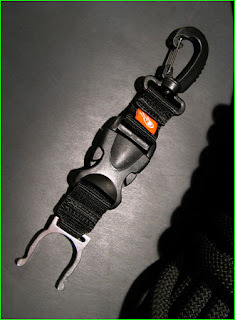 The tail features a small hole for a wrist lanyard or a split ring so you can carry this light in several ways. It is very small so keychain carry is possible. The runtime goes from 1 hour in maximum brightness to 21 hours in minimum brightness and the output is regulated so the light won't get dimmer as the battery is depleted. You can use a rechargeable battery in this flashlight if you want. With a rechargeable C123 the light will be even a little brighter. Being as small as it is the P1DCE is an outstanding pocket rocket and the multiple levels of brightness offer the choice between a long runtime or an amazing blast of light. You can get it in Natural or Black finish for $70 from Fenix-Store. This bottle holder from Civilian Labs features a stainless steel bottle holder buckled to a clip. It can be used to carry water bottles hanging from a backpack, a belt, a waistpack or other options. The metal snap adapts to the neck of common water or soda bottles and the clip attaches to your belt or pack to use it you unbuckle the plastic buckle so the clip stays clipped to the belt or backpack while the metal snap stays clipped to the bottle. The advantage over other common rubber ring based holders is that the metal snap won't get brittle or break with use and that you don't need to remove and reinsert the bottle in the holster every time you need to drink. The plastic buckle is fast enough to get the bottle whenever you want. Our field test showed that either hanging from a belt loop or a backpack a bottle of water is at no risk of falling and the buckle makes it very easy to get the bottle, sip some water and put it again in the holster. The construction is very solid, the metal snap will resist a lot of use, the plastic clip is probably not the best clip for attachment but has not demonstrated any problems during my tests. The wire gate may get out if you try to clip it to some tight straps but it is easy to put it back on. Once clipped it stays well in place. You can read more at Civilian Lab's website or order for $7 from TAD Gear.